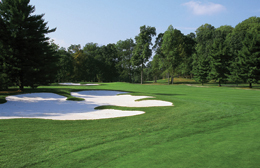 Schlegel Golf Course Design is a company dedicated to carefully forging golf courses that meet the demands of today's golfer while satisfying the great traditions of the game. With experience on all facets of golf course architecture, Dan Schlegel has been able to create a design philosophy that incorporates equally important parts of sound design based on golf's classic values, each site's natural qualities, detailed preparation of construction plans, and highly attentive on-site review of the actual construction process. The firm is committed to working closely with each of our clients to provide the highest quality product for each site's potential, and with regard to the project's budget. By maintaining a constant, but limited work load, each project is assured of receiving significant attention to detail with customized artistry and craftsmanship. Our belief is that each golf course project presents a singularly unique opportunity to create a multifaceted entity to enjoy the game of golf, commune with nature, and share camaraderie with others of different temperaments, talents, and convictions. In this regard, the golf course architect owes each site and client intensely focused attention to deliver a product that arouses the senses and demands repeat play, observation and discovery.